You do not have to purchase to enter. You cannot change prize to cash or other things. PC/Notebook usability rating: 5/5. About 7 minutes to finish, 2 open questions, need no receipt. Smartphone usability rating: 3/5. No mobile page for smartphones. You can still finish the Survey via smartphone, it may take more than 7 minutes to finish. Rate the following questions like "How would you rate the quality of the drink you purchased?" Answer open questions like "Is there a specific barista that gave you great service during your visit?" If you have any problem or difficulty to finish Costa coffee online customer satisfaction survey, refer to the following survey video recorded by Survebag editorial team. 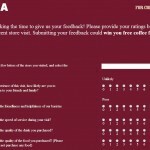 You can also find those related questions and answers related to Costa coffee customer survey in this article. Costa Coffee is a British multinational coffeehouse company headquartered in Dunstable, United Kingdom, and a wholly owned subsidiary of Whitbread PLC. It is the second largest coffeehouse chain in the world behind Starbucks and the largest in the United Kingdon. I VISITED EUSTON COSTA THIS MORNING AT 8AM IT WAS EXTREMELY BUSY BUT SERVICE WAS REALLY FRIENDLY & QUICK.A LADY WAS VERY POLITE & WELL MANNERED.I'VE BEEN SERVED AS SOON AS I JOINED QUEUE & GOT MY DRINK QUICK AS WELL. TEAM WORK WAS EXCELLENT.MY COFFEE WAS AS PER STANDARD.I WAS REALLY SATISFIED. First visit to Costa at Skippers Lane site, Middlesbrough, excellent service by all staff who were very polite & efficient, the premises where very clean & great atmosphere, well done to all who work there, will be returning regularly now! We found the young manageress at Tesco Stroud Glos very efficient and helpful. She was alert, polite and suitably witty. The premises (though fairly new) were spotless and she was cleaning as people moved out. We actually had tea to drink; it was not expensive but was not particularly good. The cake was fine but we had to ask the price of the pastries.